Objective: The use of stereotactic radiosurgery (SRS) is increasing in the United States (US). There are three major photon-based systems available: Gamma Knife (GK), CyberKnife (CK), and gantry-based linear accelerator (linac) systems. We sought to provide a recent description of the US distribution of these systems. Methods/Materials: Analysis of the respective manufacturer websites for each system allowed for the compilation of a database by location. Several demographic variables were collected including county population, physician distribution, median household income, and academic affiliation. Machines were mapped by type and by state distribution. Multinomial logistic regression assessed for correlations between covariables and the endpoint of having a certain type of SRS system. Data collection and analysis was completed in 2017. Results: There are 428 dedicated SRS systems in the United States, with linac-based systems the most common (39%), followed by CK (35%) and GK (26%). Relative to GK, CK (odds ratio [OR]: 0.39; 95% confidence interval [CI]: 0.33-0.45) and linac-based systems (OR: 0.71; 95% CI: 0.60-0.85) were less likely to be associated with academic centers. Areas of higher median household incomes were associated with CK (OR: 1.01; 95% CI: 1.01-1.02), and higher populated regions were associated with linac-based machines (OR: 1.03; 95% CI: 1.00-1.06). The distribution of total SRS systems per capita varies between states, with Montana, Alaska, and Oklahoma having the highest, and South Dakota, Vermont, and Wyoming having the lowest. Conclusions: The US distribution of SRS systems varies geographically and demographically, which may lead to unequal accessibility for certain populations, and requires further research. Stereotactic radiosurgery (SRS) is commonly used to treat malignant intracranial tumors but also can be used to treat benign entities as well as extracranial tumors. This treatment modality employs the use of multiple noncoplanar beams to provide a highly conformal dose distribution with a very rapid falloff beyond the periphery of the target.1 SRS was first employed by Lars Leksell in 1967 using the Gamma Knife. Subsequently, different platforms for SRS delivery were developed, with three distinct major photon-based systems available today: Gamma Knife (Elekta, Stockholm, Sweden), CyberKnife (Accuray, Sunnyvale, California), and gantry-based linear accelerator (linac) systems including Novalis Tx (Varian [Palo Alto, California] and BrainLAB [Munich, Germany]) and Edge (Varian). Each machine has technical advantages and disadvantages, and no randomized data demonstrate superiority of any one system in terms of efficacy and/or toxicity. Recent data described increasing SRS utilization in the United States and identified multiple disparities, including less utilization at nonacademic facilities and among patients residing in lower-income regions.2 To our knowledge, there is no current literature describing the geographic distribution of SRS systems in the United States. In this report, we construct a database of SRS systems in the United States, determine the overall distribution by state, and examine select demographic features for each system type. We acquired the active US locations for the Gamma Knife (GK), CyberKnife(CK), Novalis Tx and Edge systems using the respective manufacturer websites3-6 during 2017. Novalis Tx locations were recorded only from the Novalis Tx website to avoid any potential overlap with the Varian website; therefore, the Varian website was only utilized to extract information on Edge locations. The Novalis Tx and Edge locations were grouped together to represent dedicated linac-based systems. Although other general-purpose linacs have SRS capability, it was not possible to accurately determine if they were being used for SRS based on the manufacturer website. Additionally, such systems are not always capable of treating the entire range of targets traditionally covered by SRS. As a result of these factors, our study focused on dedicated SRS systems only. We searched by state and then recorded the city, state, zip code, and facility name for each location. We then used the US census data to determine the county population (2016 estimate), which we used as a rough indicator of population density, and the median household income (in 2016 dollars).7 Using the US Census Bureau definitions, we noted whether the location was an “urbanized area” (50,000+), “urban cluster” (2500 to 49,999), or “rural area” (< 2500). We also recorded the location as nonacademic or academic if it had a radiation oncology residency program accredited by the Accreditation Council for Graduate Medical Education (ACGME).8 Data on county physician distribution was recorded from the American Medical Association (AMA) publication9 for 2015 (reflecting 2013 data), the most recent year data was available. A one-way analysis of variance (ANOVA) examined statistically significant differences between means of independent groups. A multinomial logistic regression was used to model the three-level outcome variable of machine type with GK as the reference level, and outcomes modeled as a linear combination of the independent covariables. A two-tailed Wald Z-test was used to assess the significance of coefficients with a p value ≤ 0.05 used as the threshold for statistical significance. Odds ratios (OR) and 95% confidence intervals (CI) are reported. All statistical analysis was performed using R-version 3.2.2. To test the quality of data collected on machine distribution, 20 locations were randomly selected using a random number generator and called to confirm their existence. All 20 (100%) were confirmed as SRS sites, and all 20 (100%) sites were verified to have been correctly classified as GK, CK or linac-based. To determine relative local distribution of SRS, we compared the total number of machines to the total US population as well as the number in each state to that state’s population (2017 estimate).10 All machines were mapped appropriately to their respective cities and zip codes using BatchGeo mapping software (Copyright © 2018, BatchGeo LLC), and the state distribution ratios were mapped using GeoNames via Microsoft Excel (Copyright © 2018, DSAT for MSFT, GeoNames, Navteq). A total of 428 SRS systems in the US were included in the database: 166 linac-based (39%), 149 CK (35%), and 113 GK (26%). Figure 1A shows a geographic depiction of the database by machine type. Most machines were in urbanized areas, and none were in rural areas. GK had the largest number of locations in academic centers (38%), while CK had the lowest (9%) (p < 0.001). CK comprised the largest proportion of machines in urban clusters (23%) and was associated with the highest median household income on average ($57,035), although neither of these demographic categories revealed any statistically significant differences among the SRS systems (p = 0.06) on unadjusted analysis. Table 1 contains the full results for the demographics of each system. Only 14 centers had at least 2 types of SRS systems, 7 of which were academic centers. On multinomial regression (see Table 2), going from a nonacademic to academic setting showed a decrease in the likelihood of having a CK (OR 0.39; 95% CI: 0.33 to 0.45) or a linac-based system (OR 0.71; 95% CI: 0.60 to 0.85) compared with a GK. Areas of higher median household incomes were associated with CK machines with an odds ratio of 1.01 (95% CI: 1.01 to 1.02) for every increase in median household income by $1,000. Higher populated regions were associated with linac-based machines with an odds ratio of 1.03 (95% CI: 1.00 to 1.06) per 100,000 capita. The total ratio of number of available SRS machines per 1,000,000 people in the United States was 1.31. 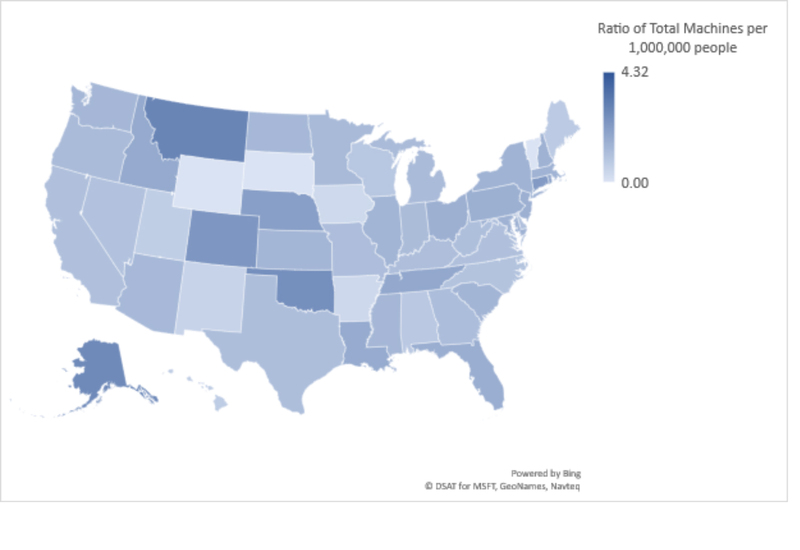 The states with the lowest ratios of SRS machines per 1,000,000 people were South Dakota, Vermont, and Wyoming (all with ratios of 0). The states with the highest ratios (excluding District of Columbia) were Montana (2.86), Alaska (2.70), and Oklahoma (2.54). Figure 1B geographically depicts this variation in distribution by state. 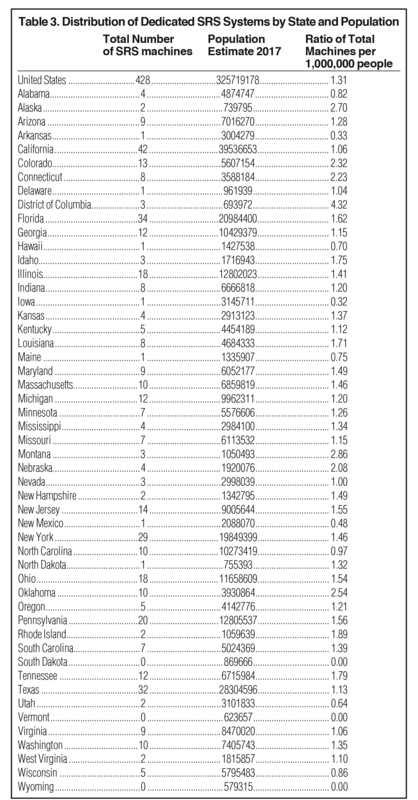 Table 3 lists the ratios for all states. Our results show an increase in the number of SRS systems compared to historic values and suggest a nationwide growth of SRS utilization overall. In 2003, approximately 160 dedicated radiosurgery units were reported.11 Since then, the number of radiosurgery units has increased by 268%. The demographics were fairly similar between machine types. Our data showed that GK systems had the largest percentage of locations in academic centers. Multiple factors could explain this association including cost, need for ancillary support, and the historical evolution of SRS within such centers, but this requires further investigation for quantification. Nonacademic centers and regions of higher household income were associated with CK systems on multinomial regression. Although a cost analysis is beyond the scope of this paper, this association may stem from differences in billing, reimbursement and/or marketing for this SRS system. Compared to the total distribution of SRS machines in the United States, several states had low distribution ratios. Although its utilization is increasing,2 the demand for SRS systems is not well-defined. Based on the 2017 Leksell Gamma Knife Treatment Statistics Report, brain metastases accounted for the largest percentage of cases (47%), followed by meningioma (17%) and vestibular schwannoma (12%).13 As more studies show high local control and low normal tissue complications with SRS for brain metastases,14,15 the demand for SRS may rise. Additionally, with advances in oncologic therapy and improved imaging techniques, the utilization of SRS to treat intracranial metastases may further increase. Our aim is to provide a snapshot of the distribution of SRS equipment in the United States, although further investigation into potential disparities in access to SRS care may be warranted. Additional limitations of our study include a potential lag time between the installation or decommission of an SRS system and the associated update on the respective manufacturer website. The random telephone-call sampling did confirm the existence and types of the SRS systems, although a couple had been modified or upgraded. This analysis did not consider general-purpose linacs that can potentially deliver SRS or less common SRS systems. Therefore, the degree to which linac-based SRS is utilized relative to GK and CK may be more pronounced, and we acknowledge that the number of procedures performed on nondedicated systems may be higher than those performed on dedicated systems. Our database (available at appliedradiationonlcology.com/articles/SRS-in-the-US) is the most recent and comprehensive list of dedicated SRS systems in the United States of which we are aware and potentially identifies areas that may be in need of such technology. It can provide patients with a resource for the multiple types of SRS systems available by location and perhaps decrease institutional limitations that restrict patients to one specific type of system. Additionally, it allows physicians and managers to visualize and understand the current distribution of SRS systems in their market and in the United States, which may guide future decisions when purchasing new equipment. This database can also serve to motivate future analyses that could further explore potential discrepancies in accessibility. McDermott PN, Orton CG. The Physics and Technology of Radiation Therapy. Madison, WI: Medical Physics Publishing; 2010. Kann BH, Park HS, Johnson SB, Chiang VL, Yu JB. Radiosurgery for brain metastases: changing practice patterns and disparities in the United States. J Natl Compr Canc Netw. 2017;15(12):1294-1502. Elekta. Leksell Gamma Knife treatment centers. https://www.elekta.com/patients/gammaknife-treatment-process/#treatment-centers. Accessed November 15, 2017. CyberKnife Accuray. Locations. 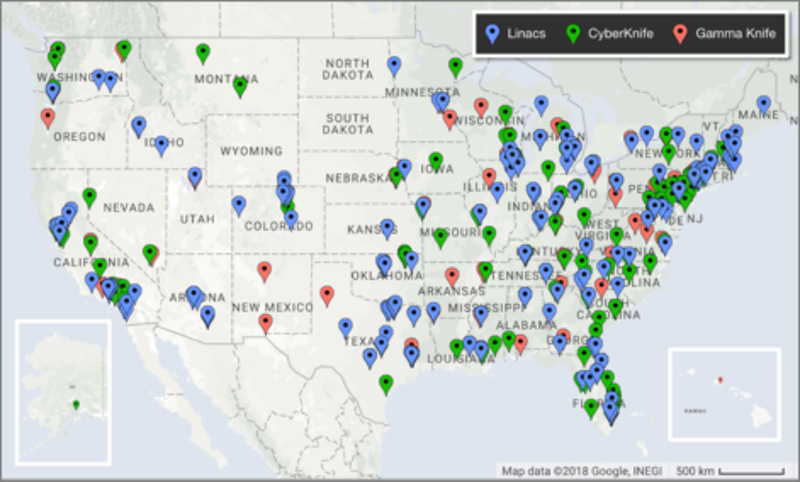 http://www.cyberknife.com/locations. Accessed November 15, 2017. Novalis Circle. Location finder. https://www.novaliscircle.org/certification/. Accessed November 20, 2017. Varian. Treatment locator. https://www.varian.com/oncology/treatment-locator. Accessed November 20, 2017. United States Census Bureau. QuickFacts United States. https://www.census.gov/quickfacts/fact/table/US/PST045217. Accessed November 20, 2017. Accreditation Council for Graduate Medical Education (ACGME) – Public. Advanced program search. https://apps.acgme.org/ads/Public/Programs/Search. Accessed November 20, 2017. American Medical Association, Physician Characteristics and Distribution in the US. 2015. United States Census Bureau. State Population Totals and Components of Change: 2010-2017. https://www.census.gov/data/datasets/2017/demo/popest/state-detail.html. Accessed February 20, 2018. Mackie TR. Linac based radiosurgery and stereotactic radiotherapy. http://www.iaea.org/inis/collection/NCLCollectionStore/_Public/40/003/40003894.pdf. Accessed February 21, 2018. Liu H, Andrews DW, Evans JJ, et al. Plan quality and treatment efficiency for radiosurgery to multiple brain metastases: non-coplanar RapidArc vs. Gamma Knife. Front Oncol. 2016;6(26):1-8. Elekta. Leksell Gamma Knife Icon: Shaping a new era in intracranial radiosurgery. https://www.elekta.com/dam/jcr:fe5c2df2-3f37-493b-bcd9-2693ef6c1c41/LPCIWB170830_v2.0_IWB_FLG_Icon_10.28_A4ls_f_DIGITAL.pdf. Accessed February 21, 2018. Patil CG, Pricola K, Sarmiento JM, Garg SK, Bryant A, Black KL. Whole brain radiation therapy (WBRT) alone versus WBRT and radiosurgery for the treatment of brain metastases. Cochrane Database Syst Rev. 2017;9:CD006121. Nieder C, Grosu AL, Gaspar LE. Stereotactic radiosurgery (SRS) for brain metastases: a systematic review. Radiat Oncol. 2014;9:155. Dean MK, Ahmed AA, Johnson P, Elsayyad N. Distribution of dedicated stereotactic radiosurgery systems in the United States. Appl Rad Oncol. 2019;8(1):26-30. Dr. Dean and Dr. Ahmed are senior residents, Dr. Johnson and Dr. Elsayyad are assistant professors, Department of Radiation Oncology, University of Miami Sylvester Comprehensive Cancer Center and Jackson Memorial Hospital, Miami, FL. Disclosure: The authors have no conflicts of interest to disclose. None of the authors received outside funding for the production of this original manuscript and no part of this article has been previously published elsewhere.